I have been reading your blog on the recommendation of one of the owners of my company. I am unsure of how to handle this situation. Our company has grown over the past few years and, with that growth, some roles have been re-structured, responsibilities shifted from one person to another. During this time, one of our critical business development processes appears to have shriveled from a lack of attention. It used to be a high priority, driven by the CEO, but now, it is hardly noticed, its momentum slowing to a standstill. This has caused some concern in middle management, but we are unsure how to approach the CEO without causing controversy. We are not a bunch of whiners, but we think this is important. Somehow, somewhere, the ball got dropped. Public or private, this conversation has to be held in a safe environment. In 1-1 conversations, I use the following phrase to set up the environment, “I am curious. -followed by the question-.” Curiosity is safe, keeps my agenda out of the explanation so I can truly hear the other side of the story. A university chancellor, I work with, conducts frequent “brown bag” lunch sessions with students at his campus. The “brown bag” aspect removes the formality, and creates a more candid dialogue. You might create a small “brown bag” affair, with an intimate group of “curious” managers and invite the CEO. One of my rules is “no surprises,” so the invitation should be clear to the CEO that you are there to find out the current Vision of the Business Development activities of the company. There is likely a reasonable explanation for this shift in focus. You might find this “brown bag” affair becomes a regular event, once a month, once a quarter, and quite soon, will impact the culture of the company to promote this kind of curious communication. This entry was posted in Communication Skills and tagged communication, company vision statement, environment, no surprises on April 4, 2012 by Tom Foster. I have been following your posts on Requisite Organization. How do I implement this management strategy after seven years with a lack of organization or structure? You start at the beginning, of course. Before you wreak havoc on everyone else, start with yourself. The first place to look is at your own Role Description. If you can even find it, it’s likely a mess. That’s where you start. List out all the tasks and activities in your role. I use 2×2 sticky notes, one for each task. You should end up with 50-75 tasks. Look at the tasks and see which go together. Separate the tasks (the ones that go together) into piles. You will likely end up with 5-8 piles. The names of these piles-of-tasks become the Key Result Areas for your role. These Key Result Areas (KRAs) become the structure for your Role Description. Drafting the Role Description, using your KRAs as your outline, the organization of the document falls together. Inside each KRA, list the specific tasks, identify the Level of Work, and the accountability. Once you have written your Role Description, then pick a team member (to torture) and collaborate through this same exercise. Pick someone friendly and cooperative. It will likely take 3-4 meetings over a period of 1-2 weeks before you get agreement. Then move to the next team member. By then, you will get the hang of it and you will be ready to move to the next step. 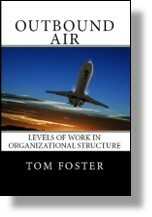 This entry was posted in Time Span and tagged administrative paperwork, environment, key result areas, requisite organization, research, science on March 6, 2012 by Tom Foster.